Q: What is your background, field of focus and role on this project? A: As project director, I’ve been responsible for the construction of the Governor Mario M. Cuomo Bridge in the northern suburbs of New York City on behalf of the New York State Thruway Authority. 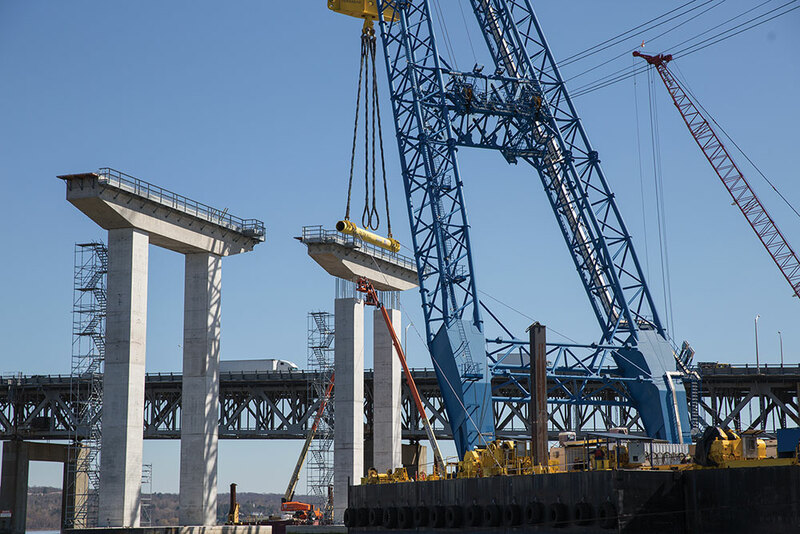 The $3.98 billion design-build project to replace the Tappan Zee Bridge with a new twin-span crossing is one of the largest bridge projects in the nation. With more than 35 years of experience in bridge management, design, construction and inspection, my specialty is in complex and long span bridges. I led the inspection, design and construction support services for the reconstruction of the Williamsburg Bridge in New York City – one of the largest bridge reconstruction projects ever undertaken in the United States – and led the design of the major bridges of the AutoRoute 30 project in Montreal, Canada, one of the biggest public-private partnership bridge projects in North America. The Governor Mario M. Cuomo Bridge in New York City will ease traffic congestion in the area and last at least 100 years without requiring major maintenance. Q: What are the goals for the project and how will it meet those goals? A: The Governor Mario M. Cuomo Bridge will stand as a signature structure for the Hudson Valley for generations to come. The new twin-span bridge is the first cable-stay crossing on the Hudson River. The 3.1-mile bridge provides a critical link across the Hudson River to serve the 50 million vehicles that use it annually. When the second span opens to traffic later this year, motorists will experience less congestion and frustration thanks to its eight general traffic lanes (four in each direction), breakdown/emergency lanes and state-of-the-art traffic monitoring system. Aside from being built transit-ready, the bridge will also feature a shared path for pedestrians and cyclists featuring six scenic overlooks and serving as both a transportation and recreational facility. The bridge also will be illuminated at night with dark-sky compliant versions of LED light fixtures utilizing an aesthetic lighting plan to emphasize the distinct features of the new structure while respecting the scenic appearance of the Hudson Valley. Perhaps most importantly, the bridge is being built to last a century without requiring major maintenance. This investment is being assured by utilizing modern technology, such as structural health monitoring and asset management systems. Precast concrete was used for pier caps, road deck panels and cross beams. Q: Which precast concrete products have you used on this project and how were they used? A: The project has used a vast amount of precast concrete materials, including pile caps, pier caps, road deck panels and crossbeams between its eight iconic towers. The four crossbeams – two 70-foot-long beams for the westbound span and two 60-foot-long beams for the eastbound span – weigh nearly 3,000 tons in total. The crossbeams were cast on a floating barge in Chesapeake, Va., and barged directly to the main span for installation. Nearly 7,000 steel-reinforced concrete deck panels are being used to provide the base driving surface. Weighing as much as 74,000 pounds each, the approach span deck panels are 12 feet long, range between 22 and 45 feet wide and nearly 11 inches thick. When fully assembled, the deck panels for both the approach and main spans will comprise a surface area of more than 65 acres – approximately equal to the deck space of all 19 U.S. Navy aircraft carriers currently in service. Q: What have been the benefits of using precast concrete products on this project? A: Modular construction with off-site fabrication and assembly has been utilized extensively. The use of precast materials on our unique 3-mile-long project site has aided with scheduling and eased construction. Working off-site under controlled conditions allows for a generally safer working environment and higher quality workmanship.